The ultra-efficient duo to improve the appearance of your skin. This set consists of two facecare essentials to keep skin looking healthy and beautiful. 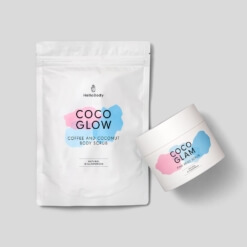 Our face scrub with natural coffee particles COCO PURE gently exfoliates, eliminating dead skin and impurities, while our peat extract mask COCO CLEAR deeply unclogs your pores, and offers a smoother, more even complexion. Discover the benefits of this set, and how it helps to significantly improve the look of your skin! Exfoliate and regenerate your skin with our creamy yet effective face scrub that contains natural coffee exfoliating particles. Recommended use: one to three times a week. Coffee bean powder: natural exfoliating particles. Moor peat extract: purifying and detoxifying. Treat yourself to a detoxifying break with this moor extract-infused mask. It binds toxins and supports the skin’s own detoxification processes – say hello to a clear complexion and flawless skin! Moor peat extract: purifies the skin. 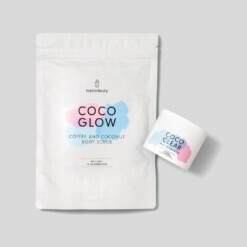 Step 1: Moisten your face with water, apply a dab of COCO PURE and gently massage our creamy scrub in circular motions. Do not leave on – rinse thoroughly with cold water. Dry your face gently before the next step. 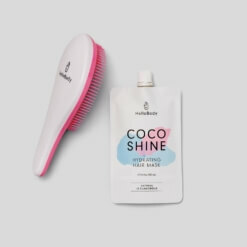 Step 2: On clean skin, apply a generous coat of COCO CLEAR using our MASK BRUSH or your fingers, avoiding the eye area. Leave on for about 15 minutes before rinsing with cold water. Then hydrate your skin with one of our facial moisturisers. Do you see a clear improvement in the appearance of your skin with this duo? Let us know in your review!